Published on The Otter-NiCHE (April, 2014). Shannon Stunden Bower. Wet Prairie: People, Land and Water in Agricultural Manitoba. Vancouver: University of British Columbia Press, 2011. 264 pp. ISBN 978-0-7748-1853-7, $35.95 (paperback). Shannon Stunden Bower undertakes an examination of wetland drainage in Manitoba, its impact upon newcomers and governmental initiatives to address the problem of agricultural flooding. Shannon Stunden Bower’s Wet Prairie builds on a long historiographical tradition in Canada that seeks to underscore the problems inherent to early settlement in Western Canada and should be viewed alongside works such as Doug Owram’s The Promise of Eden: The Canadian Expansion Movement and the Idea of the West, 1856-1900. Like Owram, Bower underscores the distinct sense of disappointment and anxiety among new settlers whose dreams were quashed when the problematical environmental realities of their new home became clear. Wet Prairie is also indicative of recent scholarship, particularly Tino Loo’s States of Nature: Conserving Canada’s Wildlife in the Twentieth Century, which seeks to highlight the nature of governmental initiatives from the perspective of environmental history. Wet Prairie also encompasses the concept of liberalism in Canada and builds upon Ian McKay’s methodological approach, which places liberalism at the forefront of Canadian history as a way of understanding how Canada developed as a nation. Bower also builds on the historical geographical approach, which has become a central component to environmental history. Cole Harris, for example, has argued that history and geography are concepts that should not be separated because a region’s physical attributes are key to understanding its historical development. A central theme in Wet Prairie is the interplay between liberalism and private ownership and the degree to which state intervention, with regard to wetland drainage, was often a source of consternation amongst residents. For example, those who resided at higher elevations were generally unwilling to pay for drainage projects that would alleviate problems for those at lower elevations, even if runoff from their own lands was complicating the situation. For these highlanders, paying the price for proper drainage projects did not matter if they themselves did not benefit from them. Many also argued that, because they had paid a premium for land at higher elevations, they should not be held responsible for drainage in low-lying areas, lands that were often less expensive. Bower also effectively incorporates the notion of an ‘ecological commons’ whereby “private property landscape is overlaid by elements of the natural world that are common to all landowners.” (13) This is indicative of the geographical focus that is a fundamentally important factor within the field of environmental history. From this perspective, political borders become less important than naturally occurring environmental barriers. Bower compliments this by encompassing a bioregional approach, which dictates that, while an ‘ecological commons’ represents the removal of barriers from a social, cultural and political perspective, the concept of bioregionalism examines the physical and environmental attributes that form a region’s natural processes. The focus on flooding also offers the opportunity to re-evaluate the dynamic of ethnic relations in Manitoba. While previous historiography of Western Canada has often emphasized the region’s diverse ethnic makeup, Bower demonstrates that problems related to flooding often resulted in the unification of various ethnic groups. She contends that, as divergent groups faced similar environmental challenges, barriers were broken down. As a result, ethnic differences were set aside in order to accommodate discourse and cooperation to alleviate problems related to surface flooding and drainage construction. This, however, was not the case for all groups, which is underscored by the experience of Indigenous peoples, which were largely left outside of the ‘ecological commons’ that united other groups. Government also placed less importance on alleviating the problems of flooding on Indigenous lands because of a racialized view that saw Indigenous agricultural activity as less important and, ultimately, less productive. Bower includes an in-depth analysis of governmental endeavours at the municipal, federal and provincial levels and the central theme is conflict over natural resource control. Furthermore, unsuccessful attempts to alleviate flooding were often compounded by governmental action, particularly around the turn of the twentieth century. While government patronage may have exacerbated problems associated with drainage construction, Bower explains that this was not the most problematic issue. For example, the creation of drainage districts did not adequately address the issues related to flooding because the watershed was not taken into consideration during their creation. One explanation offered, however, is that, for highlanders, the possibility of including the larger watershed, which would have come at a cost to them, would have been seen as a betrayal. Bower is also effective in examining the problem of drainage from a geopolitical perspective by highlighting relations between Manitoba and the United States with regard to drainage. For instance, she looks at the Roseau River, which, running from northwestern Minnesota into southern Manitoba, finds itself downstream from its American neighbour. Bower also looks at the activities of the International Joint Commission, which came as a result of the Boundary Waters Treaty of 1919 that sought to address international issues related to boundary waters. The international aspect also meant that the Dominion government became much more involved with the Roseau than it did with other waterways in Manitoba. Ultimately, Wet Prairie is a helpful resource of students of environmental history. With that said, the book is not without a few minor weaknesses. For example, Bower’s narrative may have been strengthened by more individual accounts to further demonstrate the often devastating impacts of flooding. This, however, is only a minor complaint of what is a first-rate work of environmental history and a valuable contribution to the history of Manitoba. Chris Bowles is a PhD Candidate in the Department of History at Wilfrid Laurier University. His current research concerns an environmental and cultural history of Manitoulin Island, Ontario. Citation: Chris Bowles. 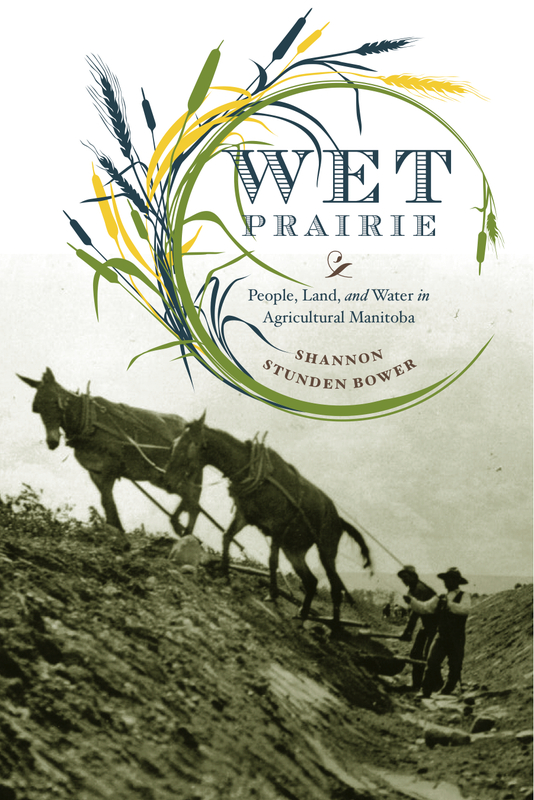 “Review of Shannon Stunden Bower’s Wet Prairie: People, Land and Water in Agricultural Manitoba.” The Otter ~ La Loutre Reviews. (April, 2014). Harris, Cole. The Resettlement of British Columbia: Essays on Colonialism and Geographic Change. Vancouver: University of British Columbia Press, 2006. McKay, Ian. “The Liberal Order Framework: A Prospectus for a Reconnaissance of Canadian History.” Canadian Historical Review 84, no. 3 (2000): pp. 617-45. Owram, Doug. Promise of Eden: The Canadian Expansion Movement and the Idea of the West, 1856-1900. Toronto: University of Toronto Press, 1981.